The Daily Show With Jon Stewart evolution: Former senior correspondent Brian Unger on how the show transformed from a scrappy underdog to a media institution. I was a correspondent during the show’s earliest years, when it was still a scrappy underdog poking the media in the eye. Then I watched it balloon into a media institution itself. In a space that was more walk-in closet than office, the man was seated atop the metal-boxed heating unit, smoking a cigarette and wearing a rubber rain slicker. The smell was a mix of airport lounge and New York downpour. The words he spoke still make me laugh nearly 20 years later: “Man, this show is never going to make it. It’s a sinking ship.” This was quite a contrast with the rosy optimism I was bringing to my first day at my new job—a brand new show called The Daily Show. I’m not sure which was more crushing: that I was sharing an office with A. Whitney Brown—a smoker!—or that the legitimate news career I’d spent hundreds of thousands of hours preparing for while other children played baseball was over. I’d gone from studying Cincinnati anchors Al Schottelkotte and Nick Clooney; national newsmen Walter Cronkite, Frank Reynolds, Peter Jennings; and news magazine men like Mike Wallace and Stone Phillips to becoming a CBS News producer. In this dark moment with Whitney, I saw the crystallization of the enormous mistake I had made, and even more, the sin I had committed—leaving real news for entertainment, an irreversible career trajectory that would forever transform me into an untrustworthy, unfaithful, unhireable clown. Whitney eventually taught me how to smoke in the office, and also how to write a joke. We all drank a lot of scotch, and smoked some pot, and poured our collective media and news rage into the cement mixture that became The Daily Show. What a sturdy foundation it turned out to be. When I started as a producer and correspondent, I brought to the show a persona that was a composite of people I had watched and with whom I had worked: a mainstream, network TV news correspondent’s stupid mannerisms and hollow conventions, the pious journalistic authority and omniscience, the preconceived storytelling, the self-importance, and parasitic reporting. The early Daily Show staff was an unlikely ensemble. Rob Fox from MTV News managed a slew of young, hard-working, and ambitious producers. David Small, a gifted network news editor, drew the blueprint for the field pieces, giving them structural and narrative authenticity. Madeleine Smithberg ran the show; Lizz Winstead ran a room of six brilliant writers—a mix of stand-ups and print writers. Beth Littleford and Whitney were both otherworldly funny correspondents, and Craig Kilborn, from ESPN, was our Ted Baxter. We held two weeks of rehearsals, shot no pilot, and then went on the air, with no studio audience—just the inimitable someone-stepped-on-a-duck laugh of producer Hank Gallo telling us if we were hitting the mark. On our first show, as I sat across from Kilborn at the anchor desk, he pinched his leg so hard during the taping he caused a bruise that lasted for weeks. Back then, the presence of three highly competitive, ideologically warring cable news networks was a new phenomenon, and their respective dogmatic programming had yet to be fully realized, branded, and sold to viewers the way it is today. And the volume of raw news footage that we could collect and satirize was less available, too. Fox News and MSNBC were toddlers compared with old stalwart CNN, who provided us with the most bounty. We ridiculed its packaging of news, its graphics, its shows (Whit and I performed three sketches taking down Crossfire), and its cadre of correspondents. We hit the campaign trail and traveled to the debates. We covered the trial of the century: O.J. Simpson. (It was my second tour of O.J. duty, having covered the earlier criminal trial as an actual reporter, which pretty much drove me out of news). And we served up nightly that other long national nightmare: the Monica Lewinsky scandal and Clinton impeachment. In 1996, and this is hard to believe, there was actual “breaking” news—urgent bulletins with live, unfolding, often surreal events—unlike today’s regular news programming that is constantly framed as “breaking.” When Andrew Cunanan was on the loose after shooting Gianni Versace in Miami, we dispatched our team of correspondents to any setting with a boat, any boat. When hurricanes hit, we submerged ourselves in the ocean. When car chases gripped the nation, we rewrote the narration. We delivered the movie box office results in Italian lire (voiced by Madeleine); Lizz had her parents deliver Final Jeopardy nightly (until Sony sent us a cease and desist); Michael Blieden deconstructed music videos; Frank DeCaro’s “Out at the Movies” chronicled the burgeoning mainstreaming of gay culture; Jon Bloom chronicled religion in a hilarious segment called “God Stuff”; and Lewis Black’s “Back in Black” raged. New correspondents, like Mo Rocca and Stephen Colbert, arrived about two years in to help with the heavy lifting. Reality TV was an infant—there were no docu-soaps or competition reality shows. Instead, we had When Animals Attack! And what mostly dominated the airwaves were nightly newsmagazines like Dateline: NBC. Everywhere. Every night. Remember 60 Minutes II? They were full of recurring segments and refillable, cutely named bits that we ripped off and renamed—“Moment of Zen” was copied from CBS Sunday Morning’s closing few minutes of miscellaneous water fowl. We satirized people in the news with first-world problems in a segment called “American Victim.” We went after all of television news, local and national, because no one else was doing it, and in those early years, we got to the low-hanging fruit first. Our tools were prehistoric by today’s standards. The Web, still relatively new, was more supplemental than primary. We depended on the newswires—and video from the AP, Reuters, and national satellite feeds of local news stories—to help us program the show. The DVR hadn’t been invented yet; we used VHS tapes to record in-house. We shot stories on clunky Betacam tapes that we shipped to our locations in advance. We had no clue that the show was an institution in the making, or that it would be, as studies claim, a main source of news for young viewers, let alone that it would ever be mentioned in the same sentence as Emmy. We just didn’t see ourselves as all that important to the outside world. This was our occupational therapy. We were the furthest things on TV from journalistic establishment, not even close to the Fourth Estate. In the years that followed, I watched with a mix of pride and fascination and awe as the show ballooned in the cultural imagination. Even when I wasn’t watching The Daily Show regularly, I watched the media watch it, relentlessly covering everything that its host did. The anchorman morphed. Gone was Kilborn’s Martini-soaked parody and frat guy swag. In was Stewart’s incredulous Everyman, who over time, was free to play himself and not a role. It was amazing to see the staffers I had known like family climb the ranks. But I was also struck by how the media fawned over a show that was designed to make fun of them. The more the show rubbed the media’s nose in their crap, so to speak, the more of a darling the show seemed to become. Then came the string of awards, with Jon’s name in the same sentences as Cronkite, Murrow, and Twain, and the show’s growing self-awareness of its own influence. I couldn’t believe that this scrappy little cable TV show on Comedy Central, tearing the guts out of mainstream media nightly, had become the mainstream media itself. The Daily Show has always been a giant mirror, reflecting the media of our time, and then distorting the image to make its own satirical point. But our attitudes toward mainstream media are now very different. 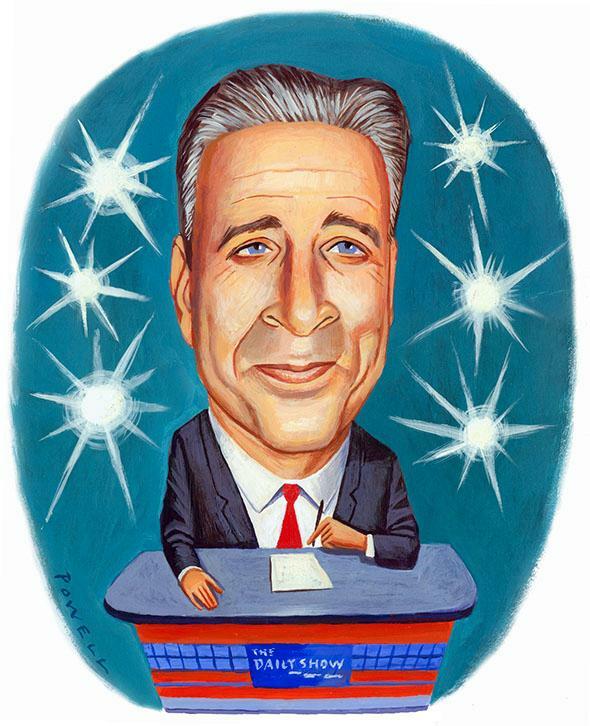 Stewart’s Daily Show reflects the opposite of the media culture that the show once reflected. When we started, the media was awash in tabloidism and fame-seekers who were just learning how to manipulate media and get their messages on TV. We were less politically saturated as a culture because the mainstream news media were less politically saturated. Now there’s a daily tidal wave of absurd political sameness, the vitriolic, almost hateful stridency of cable news personalities, the exhaustive, myopic coverage of non-news events, not to mention the peddling of dogma as news and the blatant manufacturing of truth that Stephen Colbert so beautifully satirized. It’s a complex news evolution that transpired in a freakishly short time. But I think the show’s basic architecture, as well as its intention, has remained the same. It was natural news law that The Daily Show would evolve, go deeper, and, ironically, get more serious and grow more self-aware. Just as I was departing the show, the world caught on to us and eventually got in on the joke. Once, just for fun, I told a reticent interviewee I worked for the To-Daily show, to confuse us with the Today show—because as we became more known, more successful, it was already getting harder to convince people to sign the releases. I think we all saw this coming. It was editorial attrition. With Stewart, the show became increasingly filtered through the particular worldview of its host—more paternalistic than journalistic. But I noticed the biggest change in the show after 9/11: The Daily Show got more serious. This was partly because of the show’s growing sense of cultural duty and partly because the nature of political comedy, more generally, had changed. Comedy’s fast-twitch muscles became less reactive and fluffy, and more introspective and substantive, as media laziness and unthinking TV propagandizing came to feel more like a dire cultural threat. And so parody became less fashionable, and as for satire, it didn’t die after 9/11 as everyone predicted. It just got more earnest. It’s no wonder Jon’s leaving now. Daily TV is a grind even when it’s a passion, and he did that grind for a long, long time. Though I started out by telling myself that I was doing the show just for laughs, I began to feel, in my heart, that I was working as a corrective. And anger only gets you so far. I remember feeling so pissed that TV news had become such a commodity and so sensational. But mostly, I just felt tired. Now, it’s hard to care so much. MSNBC’s ratings are often smaller than my local public radio station’s and my 16-year-old niece, India, has no idea what the Situation Room is. In 2015, when so few people actually watch live TV on broadcast or cable, raging at cable news can feel like kicking a dead horse. John Oliver and Bill Maher have demonstrated this transcendence. Their shows rarely, if ever, include outrageous clips from cable news and are less ripped-from-the-headlines. They cover a spectrum of stories from less mainstream sources, most of them unrelated to media, and closer to a topic or issue itself. And so Trevor Noah and his producers, too, will have to evolve The Daily Show. They’ll have to wrap their satirical arms around an even vaster flood of news and information, most of it untelevised, on the Web, social media, and beyond. That’s hard to do in a visual medium, but as long as content is relevant—and funny—people will watch. Much of its writing staff, and producers, are staying on, after all. I’m convinced The Daily Show is now like the Catholic Church. It doesn’t matter who’s Pope. The faithful will still believe. While I was at The Daily Show, I guess I never really got past A. Whitney Brown’s startup prognostication that we were all on a sinking ship. Maybe I would have stayed longer. But I did work in news again, at CNN, filling in for Keith Olbermann on MSNBC, and most gratifyingly at NPR for six years. It’s still weird to me that anyone would consider me for a news gig after appearing in It’s Always Sunny in Philadelphia or after I chased Salvation Army Santa Clauses around New York City for The Daily Show, demanding to inspect their credentials and count the money in their red buckets. The once impenetrable iron curtain separating news and comedy is gone now. The concept that you can be funny and credible, even serious, on TV, all at the same time, is no longer radical. The Daily Show tore down that wall. And I’m starting to think that the show just might make it after all. Read more in Slate about Jon Stewart.